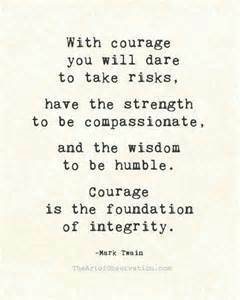 Our value word for this month is Courage. Courage takes many forms. You can show courage by standing up for a friend, helping someone in need or sticking with something that is hard for you. You can show courage by facing your fears or by talking about things that worry you. Having courage makes you a better person, a better student and a better citizen of the world. · Think of something courageous you have done – how did it make you feel? · Find out something about a courageous person. What made them courageous? · Think about some of the things you can do in your life that will take courage. See what you can find out about the following courageous people – Rosa Parks, Nelson Mandela, Joan of Arc and Spencer West.